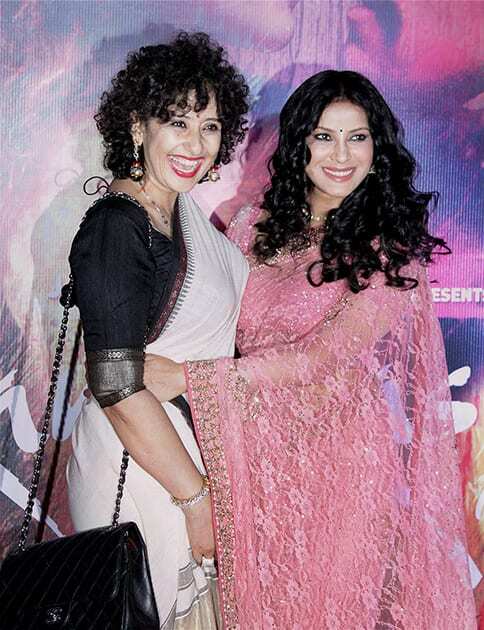 Manisha Koirala and Nandana Sen during the screening of film Rang Rasiya in Mumbai. Khloe Kardashian is all smiles with Shrek, Donkey and Princess Fiona as she visits Adventure to Santa, a DreamWorks DreamPlace at Glendale Galleria in Los Angeles. Jennifer Lopez attends 'Jennifer Lopez in Conversation with Hoda Kotb' at 92Y, in New York. British models Cara Delevingne and Kate Moss pose during a photocall as they attend the Magical Christmas Journey event hosted by Burberry, in Paris, France. Anne Hathaway and Marlo Thomas, attend the 2014 World of Children Awards at 583 Park Avenue, in New York. A model wears a creation from the Vitorino Campos Winter collection during the Sao Paulo Fashion Week in Sao Paulo, Brazil.